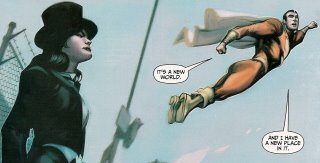 COMIC STORY ARC: THE RETURN OF CAPTAIN MARVEL! This is a gritty stylized version of the golden age hero Captain Marvel. The story written by Judd Winick gives the reader a realistic worldly vision of the character. The original character by C.C. Beck was more humorous and subtle. This new vision of Captain Marvel is fighting forces from the underworld. Billy Batson the alter ego of Captain Marvel is not the cute teenager that lags behind a newspaper boy persona. Billy gets right into the action. Billy decoys himself as a child worker. Slave traders kidnapped him with other teens. Once discovered, Billy yells the magic word “SHAZAM,” and grants the situation over to Captain Marvel. The new exploits of Captain Marvel come after the confrontation with The Spectre and the fight for magic. The aftermath storyline spirals out of Infinite Crisis saga and could be his most challenging. Captain Marvel is fighting against demonic powers and sorcerers. The whole structure of the world of magic has changed and so has Captain Marvel. Howard Porter's artwork in the boards has the look of oil paintings on canvas. This style resembles the artist Alex Ross but not as precise in presentation. 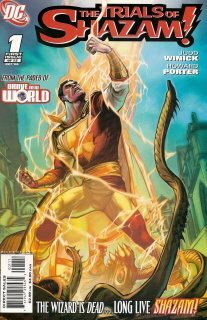 The Trials of Shazam#1 are one of many titles redefining the change in the DC universe. This title wins an inquisitive rating of four!